For Heidenhain TNC and iTNC controllers this program enables to read and output PLC data from an external PC connected to the controller via Ethernet network. It supports reading of PLC MARKER, BYTE, WORD and DWORD values. For all supported data types you can scan adjustable PLC address ranges and output their values. You can also search PLC address ranges for a target value. 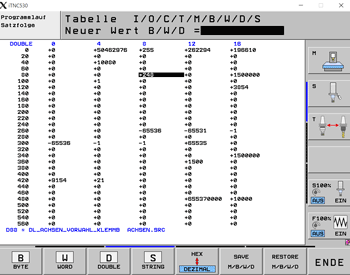 It also allows to convert PLC output data from older TNC 426 and 430 devices to match the values shown at the controller. Download readtncplc.zip and extract all files to a folder of your choice on your PC. 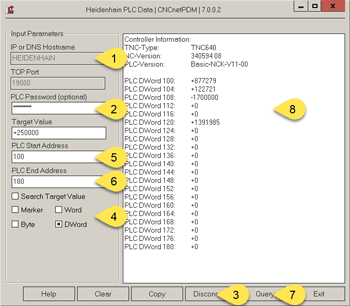 Double click HeidenhainPLC.exe and enter the IP Address or DNS Hostname of your controller (1). Input a start (1) and end (3) address for the PLC address range you’d like to get data from. Select at least one PLC area you’d like to scan, here Marker (4). After clicking button [Query] (5) the program tries to connect to your controller and read the requested data. If you search for a WORD address value the start address has to be divisible by 2 e.g. 490, 492. If you search for a DORD address value the start address has to be divisible by 4 e.g. 360, 364. To search for a target value enter target value, PLC start and end address and check ‘Search Target Value’ before clicking button [Query]. If searching for markers by target value only 0 or 1 as target value deliver results. If you’re working on an older TNC 426 or 430 controller it may be required to activate the ‘Swap’ checkbox to get matching results. If you have installed CNCnetPDM on your PC with a license other than a ‘free license’ and run this program from the folder where CNCnetPDM is installed you get unlimited functionality and output. With a free license you can search for values of one address at a time. Searching for target values is not supported in this case. Please see licensing for details or contact us if you have any questions.